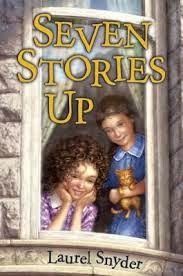 Seven Stories Up, by Laurel Snyder (Random House, January 2014), is a lovely introduction to the fun (and tension) of time travel for older elementary school kids (the confidently reading third graders through the fifth graders). Annie doesn't know her grandmother. There's one picture of them together when she was a baby, and that's it. Now her grandmother is dying, and her mother takes her to the old family hotel in Baltimore to say goodbye. And Annie's one encounter with her dying grandma is enough to make her realize why her mother never wanted to go home. The shenanigans of the girls are relatively mild. There's enough tension (from both the uncertinty of how Annie will get home, and the adventures of the two girls) to make the book absorbing, but not so much as to make things uncomfy. And the friendship between the two girls, both very engaging characters, makes for very pleasant reading. I wanted to join them in their adventures (except the roller skating fiasco). Plus--bonus kitten! And also plus (though not so much as a kitten)--interesting look at depression era Baltimore. And as a further plus--it encourages empathy and an understanding of how cranky old grownups might have gotten to be the way they are! I short, I enjoyed it lots, and I can whole-heartedly recommend it to my eight-year old self. If you have a young fan of Annie Burrow's The Magic Half, give her this one. Or if this your young reader's first foray into time travel, have that one on hand, and then offer Charlotte Sometimes, by Penelope Farmer. Too young for my readers- that was my problem. The Depression era setting was interesting, but I haven't been able to get many stduents to read Bigger Than A Breadbox, so will pass in this. I can see myself liking this at 8 as well. Hmm, I like the sound of this, and I enjoyed Any Which Wall by Snyder.